September we will be attending both the International Bigfoot Conference in Kennewick, WA (On Friday) and then the following weekend the entire team will be appearing at Rose City Comicon in Portland, OR. We certainly hope you can make it out and if able please represent and wear your best Cosplay of Sasquatch, Bigfoot. 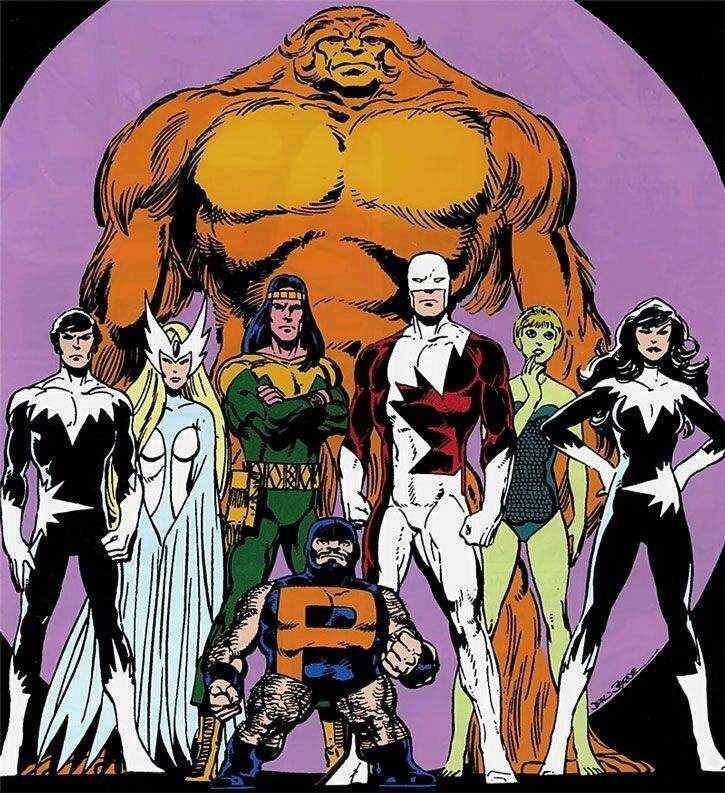 The team will have an amazing Alpha Flight layout and we hope you enjoy your time. Thanks to everyone who joined us on Expedition 2018, we wish we had better air quality, but the two day excursion was a lot of fun. We met a lot of new people and had an amazing time exploring nature, and habitat. While we did not find anything compelling in (Location Undisclosed) we did enjoy a few amazing night screams across the lower valley floor. While it could've been an elk or a sick and distressed coyote, a few calls were much more interesting and we hope to share on an upcoming episode. Stay tuned and again if you are interested in Expedition 2019, sign up soon, space is running out. Summer fun - We hope you are able to get out in nature. We got skunked - no new news, but we did find some interesting structures this summer, but nothing we couldn't debunk, so while we wished we had found some great evidence on our three weekends we came up empty handed. We are going to try a new area up in BC this month, but while this area yielded some interesting tales last year, this year we came up empty handed. The good news is however, we made some great camp fire memories! 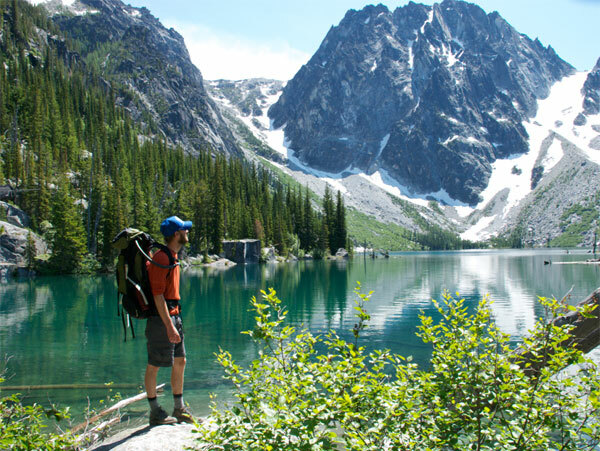 Always fun to take a hike in the Cascades - Welcome to Summer and enjoy nature! We have a lot planned this month, trips to AlienCon in Pasadena, CA, followed by trips to British Columbia, Southern Oregon and Alaska. We hope to have some exciting new tales and adventures - stay tuned. 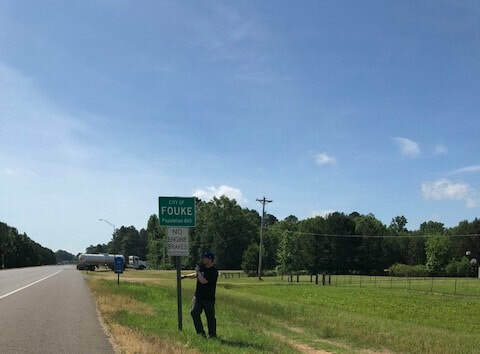 May was a wonderful month, and we were pleased to be invited on a film shoot in Fouke, AR at Boggy Creek. For those signed up to the free ​member area I took the time over lunch to run over to MonsterMart a local gas station and museum and attached some photos. While we can't release all the details on the film, until the production is released, it was a fantastic trip and for those that may never get to journey to this off the grid area, we brought some of the highlights to you you. More to come and thanks as always for Joining the Syndicate! 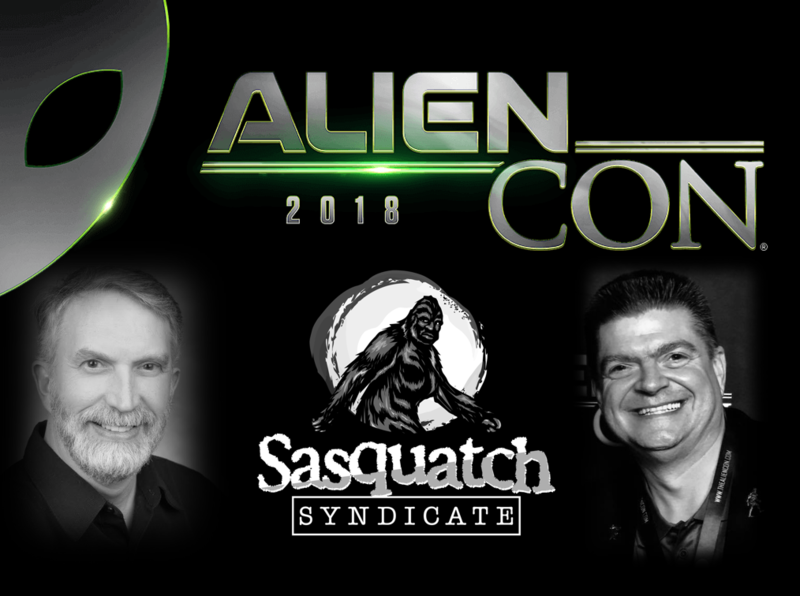 Please join us at AlienCon this June and tickets can still be picked up at www.thealiencon.com. 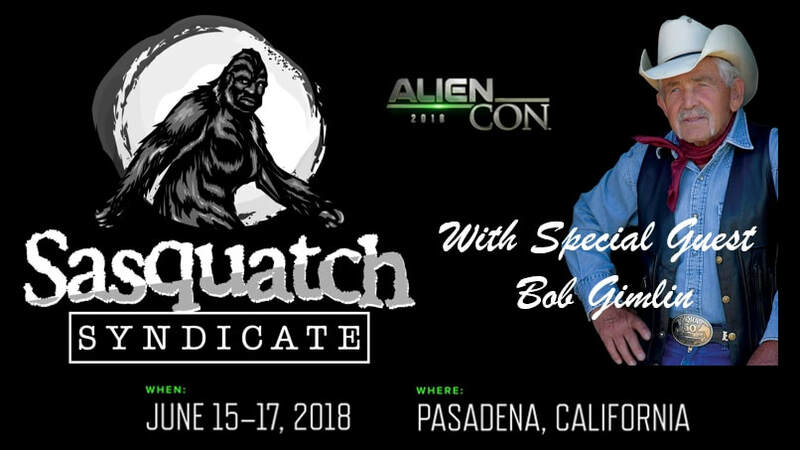 Bob Gimlin will also be in appearance so if your in Pasadena, CA please visit the team. We look forward to seeing you there! 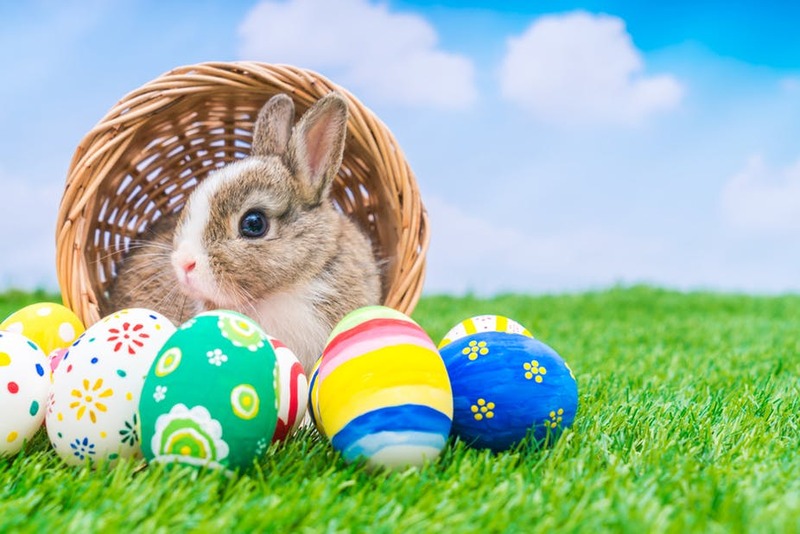 Sping Break is upon us and we are getting back out on the trail- so have a great Easter and enjoy your spring and we hope to have some great new photos from our trips coming soon so check back - Happy Easter!! and have a great spring everybody! Russell Accord - Author, Film Editor, Producer, Manager and Host of the International Bigfoot Conference and Film Festival. As Russell Accord joins us this month, we will be talking about his book series leading up to Bigfoot of the Bitter root. Bigfoot and the Tripwire is the second book of a three part Bitter root Series. Our main Character John Stone, has returned home from his military deployment in Vietnam and is forced into the wilderness when a family member is murdered. His reaction to the murder would certainly land him in hot water with the local authorities; his only choice is to disappear into the wild. Only able to take what he could fit into his backpack, John Stone embraces his fate and sets his sights on the high country of the Bitter roots. With the rugged Montana Mountains as his new home, he discovers new challenges that will test him in ways that he never would have imagined. Facing the odds of treacherous terrain, adverse weather and building a solid shelter before winter sets in, John Stone realizes that his neighbors are none other than the legendary Bigfoot. The interaction between the group and himself evolves over time and they learn a great deal from each other. The slippery slope of allowing a human to coexist within the culture of the Bigfoot group will demand a little give and take from both parties. Although from two ‘separate worlds’, the continuous association can often blur the fine line of where he fits in and similarities of the human like tribe. Join us as we discuss this and a few upcoming events. 3/28/2018 - A week tomorrow, the new kids on the block with Extreme Expeditions Northwest heads off from Northern Vancouver Island deep into my bush world to a region I once watched logging camps and was a hunting guide. 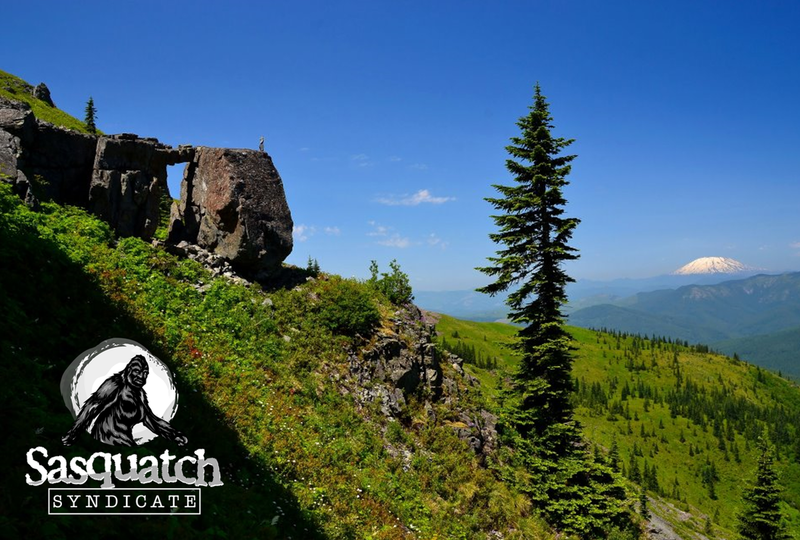 An area with decades of Sasquatch stories and encounters by Natives and pioneers in logging back in the day. Known famously in recent years as a place clam diggers have encounters during the night low tides! Steve Majors has put together Adam Davies and myself as trackers and guides. Yes, we just finished one major expedition on yacht and due to the success of expedition Steven quickly put another expedition together for beginning of April. Another expedition is scheduled for the monster seaweed tides of May! Check out website EXTREME EXPEDITIONS NORTHWEST. Can you imagine going on a Sasquatch expedition with the world famous Adam Davies! I know I am just in awe listening to his stories and exploits around the world searching for hairy bi-pedal cryptids! 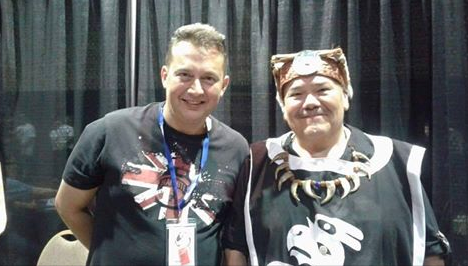 Steven Major is a wealth of information and has had his fair share of encounters and seeing tracks. He even saw hand tracks where one bent down in a stream for a mouthful of water! He grew up in coastal logging camps of B.C. Three bushers who are trying their darnedest to try and get all that conclusive proof of the existence of Sasquatch. 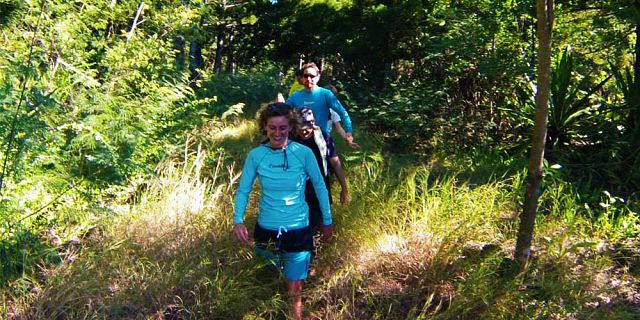 Three bushers to bring one out and give them the Sasquatch expedition of a lifetime! Three bushers documenting all for television shows and documentaries, so all can see what we are doing and achieving! As I said a few years back, all I need is someone to come out with me with a camera and audio recorders and the chances are very good we will come back to concrete world with good evidence of the existence of Sasquatch /Bigfoot. I have shown that the exposed shellfish beaches are where it's at for getting amazing audio and soon un-blurry pictures/video without all those tree branches and leaves in the way! The push is on people to get that conclusive proof! I feel real good were going to come up spades and soon all will be charging out of the bush of North America to come study coastal Sasquatch. It's like looking for a needle in a haystack and when they come out onto the beaches their is no hay anymore and the needle is easier to find! I am guiding our group into a place I know well and one thing I know is few ever get up there to those clam beaches from September to beginning of May! Instead of saying, "Ahhh, I had the chance to head out on an expedition and help make history with them." Don't be sorry, book now to come to Sasquatch Research Camp on Vancouver Island with me or onto one of our numerous boat based trips. I can even jump in your vehicle and show you awesome places in and around Seattle region. You can always contact me direct and I will be happy to fill you in and take your booking! Ask to join Sasquatch Island my Facebook Group to stay on-top of our posts and don't forget I will be sharing all with podcasts that invite me to speak about our endeavors and discoveries! ​Dr. John Bindernagel, 76, passed away during the evening of January 17, 2018. Obviously as other's will attest, John Bindernagel was simply a great man. He was a loving husband, father, and from our estimation a humble, intelligent, and peaceful being. Dr. Bindernagel was passionate about everything he did from fatherhood, to bird-watching, to Sasquatch, and it was an honor to have met and been able to have spend time with John and his family. While there are many that knew John even more personally than we did, we were blessed to have had a chance to spend time with John and we do not have the words to frame what his passing means to the community other than he will be missed. In our time with John and watching John interact with people, he had no ego. While John was extremely educated on the subject of Sasquatch, John never made anyone feel foolish or unimportant. He once said to me, "Everyone is important when it comes to the subject of Sasquatch" John wanted to get the information out, credibly, to as many as he could. From our time with John, Paul and I can attest he was a very patient man, his passion and knowledge on the subject was unparalleled, and he will truly be missed as an advocate of the topic of Sasquatch. In the end, and having interviewed John, we can say he was a cannon of information. You could immediately tell he had so much to deliver and so little time. He joked with us often during our interview that he was becoming the absent minded professor and apologized for the rants, as he often times he lost his train of thought as he powered through the tangents of topics on the subject. John had so much to say and it showed. As he mentioned several times at the end on many shows, he was diligently working to put as much of his research down on paper as he possibly could. He had forgotten more than most of us will ever know regarding the subject of Sasquatch and we just wanted to say it was a privilege and honor to have met John. ​For those that missed it, we hope you had a chance to listen to this episode in it's entirety as John speaks to his legacy and his hopes for his continued research.